Home >> Generated from JAN's SOAR Information System on 4/21/2019 12:10:21 AM. 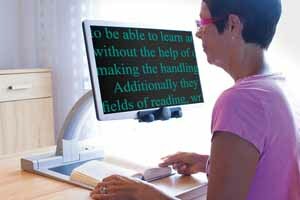 With its sleek design, 19" rotatable screen, and full HD high definition Vario camera, the Mezzo Vario is an excellent choice for people who want the highest quality reading experience in a nice, small package. It offers a full screen, desk top reading experience with true portability. The 13.5 pound unit folds flat for transport, and its rechargeable battery offers up to 2 hours of plug-free operation. The full HD Vario camera has the sharpest resolution of any camera on the market and has tremendous depth of field, with virtually no pixilation or flickering. Continuous magnification ranges from 0.9X – 100X. A great unit for those who demand more from their CCTV than just reading. Includes carrying case.